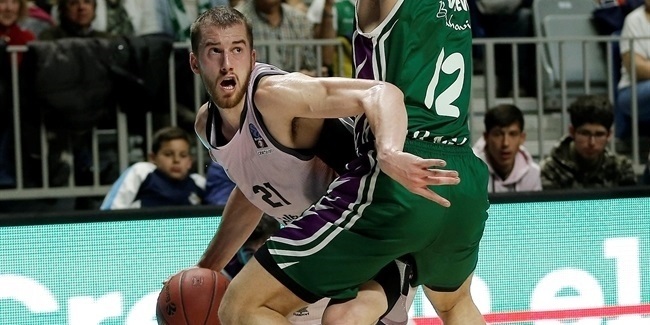 When Valencia Basket forward Alberto Abalde takes the court on Monday in search of his first 7DAYS EuroCup title, he represents more than just himself and his club; Abalde represents a family rich in basketball that has devoted a lot of time and effort to the sport for five decades. Abalde's father, Alberto Sr., was a professional basketball player and is currently a coach. Hailing from the town of Vigo, he played for local team Porcelanas Santa Clara and Obradoiro before joining OAR Ferrol, where he made his Spanish League debut in 1986. Alberto Abalde Sr. retired in 1993, two years before Alberto was born. Alberto's sister, Tamara, is six years older than her brother and has been a member of the Spanish national team. Tamara won a bronze medal at EuroBasket 2009 and now plays for Valencia's women's team in the Spanish first division. Tamara and Alberto grew up in a basketball environment, so it was only natural that they were drawn to hoops instead of other sports. "[Our father] was a player and that inspired me and my sister. We always talked about basketball and watched basketball at home," Alberto Jr. recalled. "Since we were kids, we were carried into the sport. I always liked it, but I liked a lot of other sports, too. I tried football, tennis but always knew that basketball was my favorite sport. My sister is older than me and she started to play first so after that, I started playing basketball with my friends, at school, and everything went rolling after that." "Basketball was always important in my family. My father loves basketball and played professionally and we liked it since we were kids," Tamara confirmed. Alberto Sr. had a father-son basketball experience that not a lot of people get; he was able to coach his son. "My father coached my school's mini-basket team. He likes basketball a lot and teaching many different basketball skills to kids," Alberto Jr. said. "He coached me for a year at school and when I was younger, I paid more attention to what he had to say. He taught me basketball skills in the hoop we had at home and we always watched basketball games together." Growing up, Tamara and Alberto Jr. played against each other often. "In the beginning, when I was a kid and she was a bit more grown up, we used to play one-on-one a lot. We stopped doing that through the years and when we saw each other in summer, we did other things, other activities that didn't have anything to do with basketball. But when I was a kid, yes, we played a lot against each other," Alberto Jr. remembered. Tamara told a slightly different story: "I always beat him in the beginning; there is a six-year difference and he was very little. When he grew up, the strengths started to balance, so I started to suggest shooting contest instead of one-on-one. We stopped playing one-on-one when he had started to dunk on me. I decided it was time to stop!" Tamara enjoyed a lot of success in youth basketball. She played for Spain junior national teams and helped it win three consecutive gold medals at the 2004 and 2005 U16 European Championships and the 2006 U18 European Championships. She also got a silver medal at the 2009 U20 European Championships. Her early success definitely inspired Alberto, especially her resilience in the toughest times of her career. "My sister has been a great example for me... What always impressed me most is her mental toughness." "My sister has been a great example for me. She played for the Spanish national team in all youth categories and won a lot of medals. She is a great player, but was already great at youth levels. She always played great with Spain and I always kept an eye on everything she was doing," Alberto Jr. said. "What always impressed me most is her mental toughness. It is something I learned from her. She is a hard worker and knows how to deal with bad moments. She had a severe ankle injury that required surgery, had a hard time but I remember her tough mentality helped her a lot. I always had her as a reference and she always helped me a lot." Tamara also had many nice things to say about her brother. "Alberto is a very talented player, matching his physical skills. I would highlight his strong mentality. Since he was a kid, he knew what he wanted and what it took to get there. He has worked hard since he was little, taking his work seriously, and I think that his mentality will make him a great player." Now that they live in the same city, Alberto and Tamara can hang around each other more often and even see each other's games. "She sees most of our home games, but I was only able to see some of her games because of our schedule. Most of the times they played at home, we were on the road, but I try to go see her as much as I can," Alberto Jr. said. "I feel lucky to share this and to play for the same club this season. We see each other often after practices and can watch each other's games. It is true that I can see him play more often because they play in two competitions so it is a bit more difficult for him to see me, but he came when he could and it is great," Tamara added. Alberto Jr. now has the opportunity to win the first continental title for the Abaldes, another great achievement for a family that truly loves basketball. He said he can feel the special excitement that comes with a chance to do something big in his career. "We are all very excited and looking forward to it. It is a great opportunity for me. I arrived to Valencia knowing that I would fight for titles. We won a Spanish SuperCup, even though I was injured, but we won it," Alberto Jr. said. "It would be very exciting to win the EuroCup title and play in the EuroLeague next season." "He is my little brother and everything he wins is also a success for me." Tamara is also aware of the great opportunity and wants Alberto to make the most out of it: "I always say that his success and every win he gets, I experience it as if it was mine, too. He is my little brother and everything he wins is also a success for me. I wish him luck, and I hope he can win the EuroCup this season."